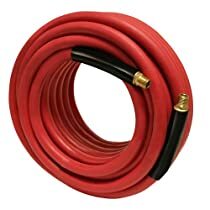 This premium rubber Apache air hose is contractor/industrial grade and made for use with air compressors, staplers, nailers and pneumatic tools. It features an excellent temperature range and stays flexible even in cold temps. It is specially formulated to be heat, weather and abrasion resistant. Each end of the hose is coupled with a 3/8", all-brass male standard thread, as well as a bend-restrictor to promote long service life. Made in India, not USA as stated?